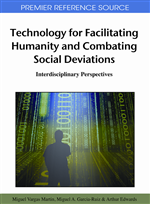 The contribution of this chapter is to present a novel approach to explain the performance of a novel Cyberbullying model applied on a Social Network using Multiagents to improve the understanding of this social behavior. This approach will be useful to answer diverse queries after gathering general information about abusive behavior. These mistreated people will be characterized by following each one of their tracks on the Web and simulated with agents to obtain information to make decisions to improve their life’s and reduce their vulnerability in different locations on a social network and to prevent its retort in others. There are different mechanisms of bulling a classmate. Bill Belsey, former president of www.cyberbullying.ca, considers next types of cyberbullying: by means of e-mail, cellular phone using text or multimedia messages: by means of instant messages, defamatory web blogs and personal Webs. According to Fante (2005) young people use web blogs, social networks and systems of instantaneous mail to intimidate their classmates, being the diffusion of altered photographies to ridicule to victims one of the preferred methods. These are distributed massively and sometimes indicating the identity of who is put under the humiliation to increase the impact. In the case of the virtual communities, many of them need an invitation to be able to enter to be member of a group, the harassment at school is based on isolating the victims of the humiliations. The Cyberbullying being an indirect and non actual form of harassment, the aggressor does not have contact with the victim, does not see his/her face, eyes, pain, suffering, consequently hardly the aggressor will be able to empathize or to wake up compassion on the other. The cyber aggressor obtains satisfaction in the elaboration of the violent act and in the imagination of the damage caused in the other, since is not possible to live it in situ (Hernandez, 2007).